Everyone knows about Taobao, Amazon, and Jing Dong. However, there are many lesser-known but equally good – if not better – online shopping sites with similar offerings, as well as ones with downright bizarre or unconventional products. Most of these lesser-known websites are more specialized than larger sites like Taobao or Jing Dong. VANCL, Womai, Jumei, ShopIn, and Mbaobao are a few of the top picks among the multitude of online shopping sites, with good quality products and reasonable prices. Ready to snazz up your summer look? VANCL, the number one internet-based apparel brand in China, offers a variety of men’s and women’s clothes, shoes, accessories, and more. Its designers come from all over the world, including Spain, Japan, and Korea. Suitable for almost all ages, this site offers both trendy casual clothes and stylish formal attire of good quality for reasonable prices (e.g. 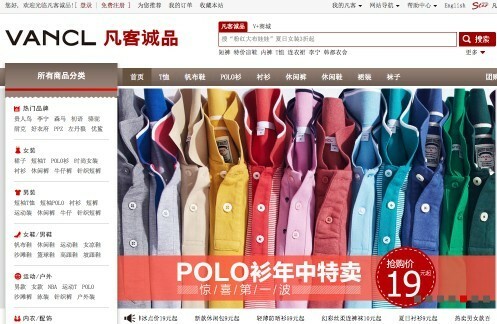 men’s polo shirts range anywhere from RMB 19 to RMB 468). VANCL has started bringing international brands such as Nike into their site with incredible discounts. In a recent sale, shoppers could get their hands on a pair of authentic Nike Air Relentless sneakers (originally priced at RMB 579) for just RMB 299. Payment methods: Online banking and payment upon delivery. For more details, visit the help page here. Problem: Buying groceries is a hassle. Solution? Have them sent to your door with just a click. Womai, operated by the China National Cereal, Oil and Foodstuffs Corporation (COFCO), is one of the largest online food retailers in China. It offers everything your local grocery store carries, from fresh fruits and veggies to packaged foods and kitchen supplies. You might think that it ends there, but there are more bizarre products as well. In the right season, you can order Chinese mitten crabs (大閘蟹); they’ll arrive at your doorstep a few weeks later, bound but still alive and squirming. Womai may wind up being a bit more costly than your local supermarket, but it offers organic food with quality that makes up for the higher prices. Payment methods: Online banking, payment upon delivery, and more (coupons/gift cards and Womai membership card). Get ready for some jaw-dropping sales and discounts! Jumei presents a range of authentic brand name cosmetics for low, low prices. Estée Lauder, Lancôme, SK-II, Elizabeth Arden, Dior, Clinique, Lush, L’Oréal, Mentholatum, O.P.I, Herborist, Biotherm – you name it. But don’t think that there’s just makeup; there are also men’s and women’s apparel and shoes and products for children. With a selection of more than 100 brands, there are new sales every day – but only for a limited time, so don’t miss out! Recent promotions include a 237mL Coppertone Kids Sunscreen SPF 50 for RMB 99 (original price: RMB 158) and a 50mL Elizabeth Arden Perpetual Moisture 24 Lotion for RMB 119 (original price: RMB 420). Payment methods: Online banking, payment upon arrival of goods, coupons, and payment through remaining balance in Jumei account. For more information on payment methods please visit the help page here. Shopping for clothes in a physical store can be quite taxing. Here’s a better way to get those brand name clothes cheaper, and it doesn’t require you to move (except for your fingers and eyes): ShopIn. Similar in concept to Jumei, ShopIn offers brand-name apparel for discounts of up to 80% off. Brands include Disney, Levi’s, BELLE, Tata, le saunda, Nike, Adidas, Converse, The North Face, JOE|ONE, Bobdog and more. Recent promotions including discounts of 75% off and more for Disney t-shirts (originally priced at nearly RMB 200), lowering prices to just RMB 30-50. Good quality, good prices, no physical exertion – what more can you ask? Grab some clothes for the entire family. Payment method: Online banking only. For more information, visit the help page here. This site, as its Chinese name indicates, specializes in women’s handbags. Whether you’re looking for a new wallet or backpacks for your next family hiking trip, this is the place to go. Offering a wide variety of handbags at reasonable prices, Mbaobao carries brands like Jamie Moore, Manhattan Portage, Crown, and Dudu. Prices vary from about RMB 50 to more than RMB 900 depending on the type, size and brand of bag. Complete your summer look with a nice dress and a smart-looking handbag! Payment methods: Online banking, payment upon delivery, and bank transfers. For more information, visit the help page here. Are you still reading this blog post? Or has your hasty little mouse already sped you off to e-lands of fashion, food, and endless enjoyment? Either way, happy shopping! Freda Zhao is a beijingkids intern (of the month) currently studying at the Western Academy of Beijing. She is one year from graduating high school. Outside of school work, she enjoys reading, painting, and mimicking cat sounds in her backyard (to draw strays to her house and feed them).